We’ve still got quite a few Rangpur limes left on our little tree, so on Sunday I decided to make something new with them—cupcakes piled high with icing. The Rangpurs have ripened to a brilliant, deep orange. They really do look like Christmas balls hanging out on the tree. They taste so good. They're even better than ordinary limes because they're not merely sour and tangy. No, in addition, they've got an elusive, faintly flowery flavor that's pretty bewitching. There’s a little hint of honeysuckle, a little taste of spring. And their scent is just intoxicating; it will drive you crazy with delight. When I was zesting the limes for my cupcakes, the kitchen smelled like the wildest, most romantic garden, a lush, warm place located somewhere in Hawaii. I kept talking anyway: "You should try this icing. It's like eating a flower." And it really was. The cupcakes turned out so delicious. I'd been pretty sure they would: The recipe is based on one I found in Vegan Cupcakes Take Over the World, which is probably my favorite vegan cookbook. Preheat the oven to 350 degrees. Melt the coconut oil over low heat and pour it into a large bowl. Blend in the sugar. Add coconut milk, almond milk, vanilla, coconut extract, and Rangpur lime zest. Mix. Add the flour, baking soda, baking powder, and salt and blend until smooth. Finally, mix in the coconut. Pour the batter into a lined cupcake pan. 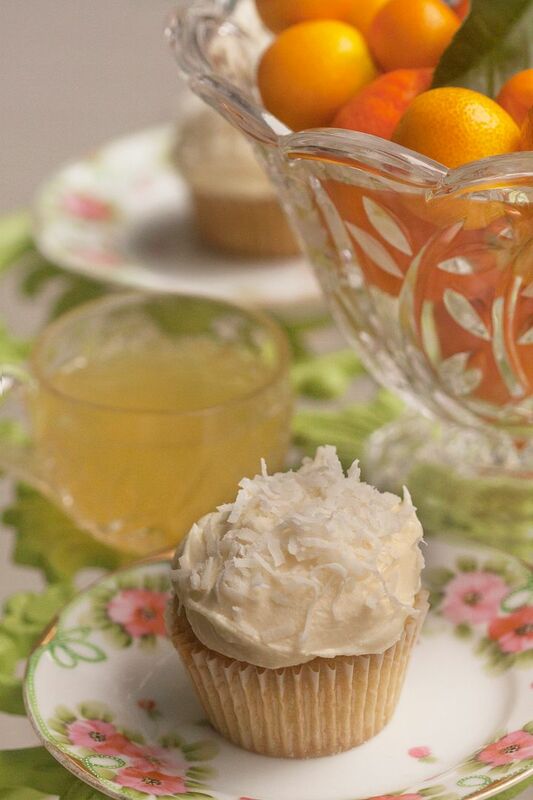 Bake for 25 to 28 minutes or until a toothpick poked into a cupcake comes out clean. While the cupcakes are baking, make the icing. Beat everything together in a large bowl until fluffy. 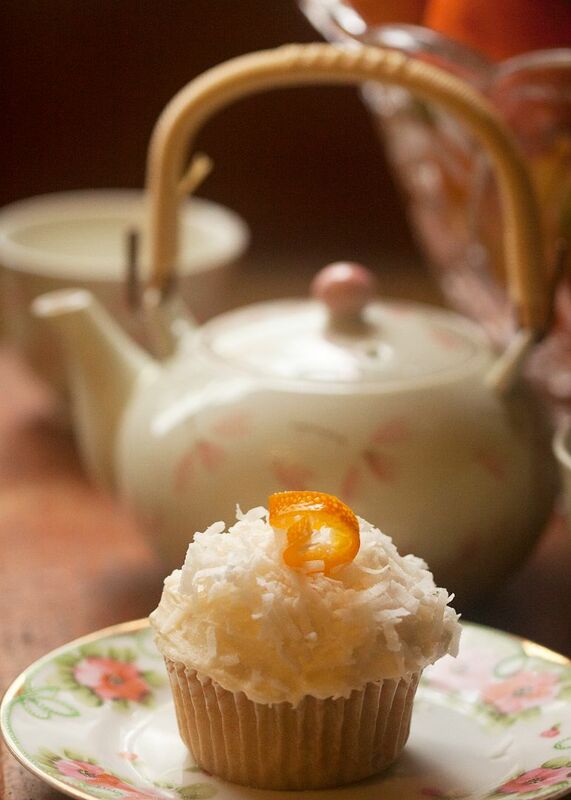 When the cupcakes have completely cooled, ice them and sprinkle shredded coconut over the tops. Leslie, your cupcake looks absolutely delicious and your description of the rangpur limes even better. I've never heard of rangpur limes but they sure are pretty. Happy new year to you! Your food images are getting better and better. The cupcakes look delicious! Oh my, these look and sound wonderful!! As much as I hate to cook/bake, this post makes me want to! On second thought, it really makes me want to give the recipe to my better half. LOL ~ I enjoy coconut anything. . . . Thanks, Susan! Hope you're having a great new year! Hi Kris, thank you! It was the ugliest, dreariest day when I took these pictures. A little sunlight would have helped so much. But alas . . .
Hi Eli, thanks! Cool people like coconut! Thank you, Lorraine! I hope you are having a nice week. I can't wait for the weekend and another chance to get outside and work on my garden projects. Hi Michelle, thanks so much for your comment and for visiting! I hadn't heard of Rangpur limes before and didn't know there was a lime that ripened to orange. Those cupcakes look and sound amazing!